One of the most famous viruses and that most havoc has caused is without a doubt Mydoom, this virus as well as generating problems to the users and leaving backdoors open, tried to topple the SCO website by means of a DDoS attack, because when Mydoom was launched this company was directly confronted with Linux in a court proceeding that stirred the foundations of the operating system. 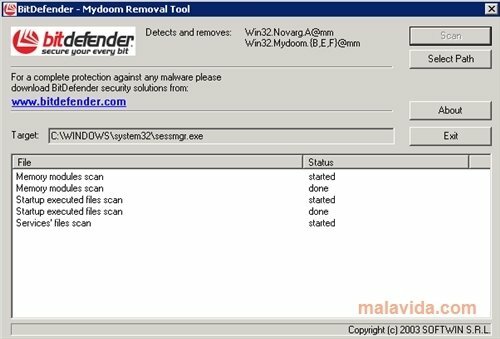 With Mydoom Removal Tool we'll manage to disinfect our system, leaving it free and protected against Mydoom. The virus only attacked SCO between the 1st and the 14th of February 2004, after this it waited for instructions. Of course, these instructions could be from sending SPAM to searching for the users' data within the computer's files, therefore, disinfecting them was a priority, especially in the case of large networks where they could actually saturate the connection. 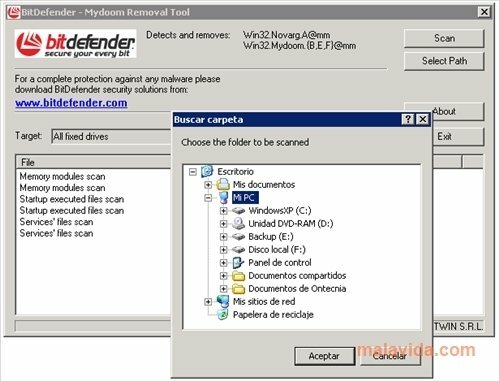 Mydoom Removal Tool is a product developed by BitDefender, the well known antivirus and computer security company, that provided this scanner to quickly solve the problems generated by this virus.